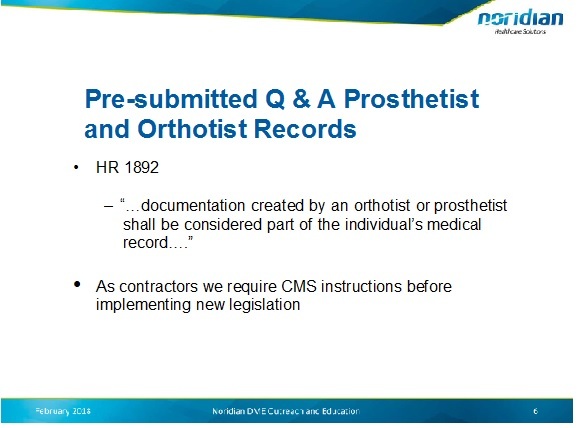 AOPA Home / 2018 / February / So Congress (and the federal law) now says our orthotist/ prosthetist notes are officially part of the medical record for purposes of medical necessity determinations… now what? *SEC. 50402. ORTHOTIST’S AND PROSTHETIST’S CLINICAL NOTES AS PART OF THE PATIENT’S MEDICAL RECORD. Section 1834(h) of the Social Security Act (42 U.S.C. 1395m(h)) is amended by adding at the end the following new paragraph. The sentence is unmistakably clear, to the point that it should be self-actuating, becoming actively in force as of the time of enactment. Since there were no regulations changed when the DME MACs changed policy by introducing the August 2011 “Dear Physician” letter, there does not seem any need for regulations to revert back to the previous policy. That being said, CMS often sees things through their own lens, so there is no assurance they won’t issue a regulation of some kind regarding this issue. That said, it seems CMS believes it needs to advise its contractors, in this case, the DME MACs, whenever there is a policy change. But before we get to that, here are some general suggestions-not based precisely in the law (which is only one sentence), but some common sense considerations as you submit claims in the interim until the major questions are resolved by some CMS announcement. You should consider submitting a copy of the provision with every claim where you include copies of your notes. There is no clarity on timing from Congress. The new law clearly applies to prostheses and orthoses you fit and bill going forward. While the law is mute on intent to retrospective application, we believe it applies to all pending and new claims and appeals. CMS may, or may not announce their comparable view. There is nothing in the provision that says that, so it may take some battles with DME MACs to resolve the retrospective question, but we do have the high ground with a brand new provision. Legally, the provision puts things back to where they were before the August 2011 “Dear Physician” letter. Then, the O/P practitioner notes could corroborate and provide additional details consistent with the physician records. The O&P notes cannot alone be the basis for satisfying the Medicare requirements of the prescription-they never could before and can’t now. So, if the physician notes state that an orthotic patient’s symptoms indicate likelihood of knee instability, and the O/P notes say our examination confirmed knee instability, that is probably fine. But if the physician makes no mention of knee instability, legally, the orthotist/prosthetist notes, standing alone, can’t fill in that void. The bottom line is while the jury is still out on how this law will ultimately be implemented, there is absolutely no harm in operating under the assumption that the law applies to outstanding appeals. Anything that will increase the chances of acceptance of practitioner records as relevant to payment decisions is a good thing. AOPA is obviously interested in getting unresolved questions resolved, and for CMS to get out word to CMS contractors, and to get things moving as Congress intended. On Friday, February 23, AOPA sent a letter from AOPA President Jim Weber and Executive Director Tom Fise to CMS Administrator Seema Verma requesting that the agency resolve the contractor’s questions in order to get the law operational. (Read the letter.) We expect that this AOPA letter will not be the only one going to the CMS Administrator, because several Members of Congress who helped write and expect Section 50402 to be implemented smoothly and efficiently may also weigh in. We will continue to keep you informed as these actions unveil further.